The successful garden has a permanent basis. There must be some flowers that appear year after year, whose position is fixed and whose appearance can be counted on. The group classed as perennials occupies this position and about flowers of this class is arranged all the various array of annuals and bulbs. These last act as reinforcements in rounding out the garden scheme. Trees and shrubs are perennials, of course; in these the stems are woody, but we are considering only those known as herbaceous perennials, having stems of a more or less soft texture that, with the exception of a few evergreen species, die back each fall, new ones appearing the following spring. Quite a number of them are too tender to be generally grown as hardy perennials, but those that bloom freely the first year—like the snapdragon—are treated as annuals, discarding them when the season is ended. Some biennials—those that do not bloom until the second year, and then die—may be placed among the perennials and considered of their class, because they seed so freely at the base of the parent plant and bloom the following year, that their presence in the border is nearly always assured. The only thing necessary to do is to transplant those not in the situation you desire them to bloom in. Rudbeckia triloba, one of the Black-eyed Susan type, is not only a good example of this class, but a charming plant that all should grow, and, moreover, it is a very accommodating one, doing splendidly in semi-shady places, such as north of buildings or under weeping trees like the rose-flowered Japanese weeping cherry. It is at home in full sunshine where it will form a broadly rounded, bushy plant about three feet in diameter and, when in full bloom, with its myriad of black-eyed flowers, it can dispel the worst case of melancholia a dyspeptic ever enjoyed. It requires a good open, rather light soil to do itself justice. If lifted when in full bloom, put into a ten-inch pot, well soaked at the roots, and set aside for a few hours away from sun and wind, it will last for two weeks as a porch or house plant. We hear a good deal about the gardens of our grandmothers, perennial gardens, in which the plants outlived the flagstones at the house door. 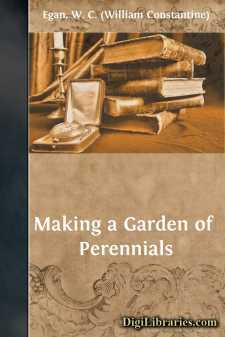 With a few exceptions, perennials are not long-lived. The gas plant, peonies, some of the iris, day lilies, and a few others, seem permanent. The usual run require to be taken up about every two or three years and divided. There are two reasons for this. In the first place, the roots have exhausted all the food within reach and, again, the main crown, from which spring the blooming shoots, dies from exhaustion. At the outer edge of this decay is generally a fringe of "live matter" which, if taken up, separate from the decayed center, divided, and reset in good soil, will rejuvenate itself, and soon form a new plant.